“It’s overwhelming,” said Fairleigh Dickinson coach Greg Herenda. “When you coach for 35 years and you take a team to an NCAA Tournament and a team that, when I got here six years ago, we had nothing. Edge connected on 7 of his 9 shots from 3-point range and went 9 of 13 overall from the field to lead the way for the Knights (21-13) in the First Four, as they advanced to take on No. 1 seed Gonzaga in Salt Lake City on Thursday. “Having coach go through that last year, I remember us being in practice and him always just telling us that he just wanted to be there with us,” Edge said. Good support also came from sophomore guard Jahil Jenkins, who scored 20 of his 22 points in the second half to go with six assists and four rebounds, while Mike Holloway Jr. and Kaleb Bishop each collected double-double in the win. Holloway Jr. had 10 points, 14 rebounds and four blocks and Bishop added 10 and 11 rebounds for Fairleigh Dickinson, which had to recover from 13-point deficits in both halves. Gary Blackson hit six 3-points on his way to scoring 26 points to lead the way for Prairie View A&M. Devonte Patterson had 17 points and eight rebounds for the Panthers (22-13), who entered the game also seeking their first NCAA tournament win. Chancellor Ellis made four 3-points and scored 12 points off the bench in the defeat for Prairie View A&M. “Could have gone either way, but I guess the best team made plays late and they were able to win the game,” said Prairie View coach Byron Smith. 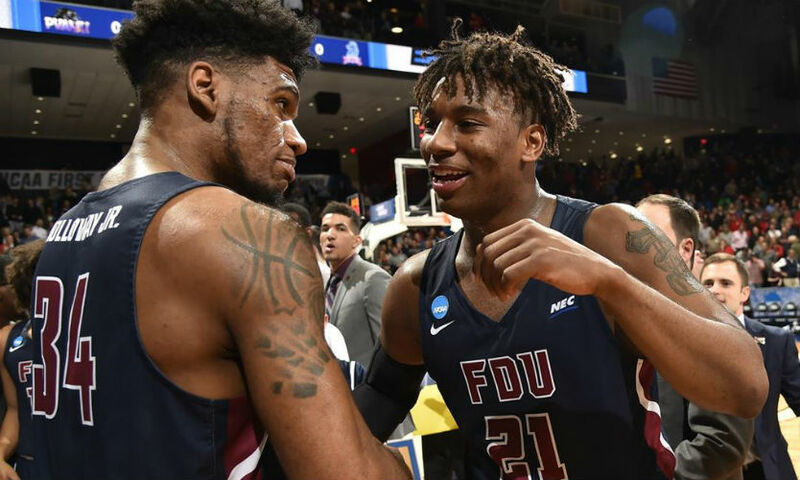 Fairleigh Dickinson will enter the main NCAA tournament bracket as the No. 16 seed in the West Region.